Established in 2015, Bournemouth University’s Orthopaedic Research Institute (BUORI) is at the forefront of developing virtual reality training and robots that will allow surgeons to perform hip replacements in this world and beyond. 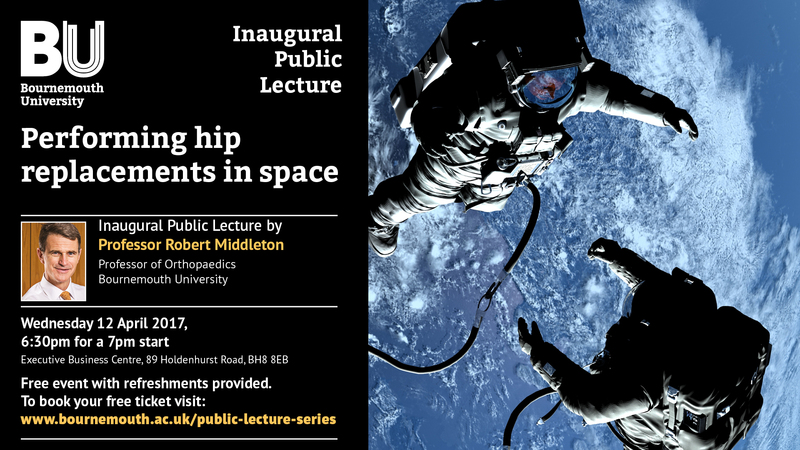 As part of his inaugural lecture, Professor Robert Middleton, Head of BUORI, will share his research into developing virtual reality training for surgeons, which allows them to practice in the space in front of them – or even in space! After the lecture, you’ll have the chance to see some of the state-of-the-art training equipment being used by BUORI and even try your hand at virtual surgery. Professor Middleton joined Bournemouth University in 2015, while continuing to practise as a Consultant Orthopaedic Surgeon at the Royal Bournemouth Hospital and working as the Director of Trauma at Poole Hospital. His extensive clinical experience helps to inform his research and the direction of Bournemouth University’s Orthopaedic Research Institute (BUORI). To book your free ticket, click here. Venue: Executive Business Centre, Holdenhurst Road. Time: 6:30pm for a 7pm lecture start. For more information about the event, please contact Rachel Bowen at rbowen@bournemouth.ac.uk.